Share the post "Calgary Landlord Busts a Scam Locksmith Calgary in Their Tracks"
Day-in and day-out, we hear horror stories from our customers who almost got scammed by a scammer locksmith. 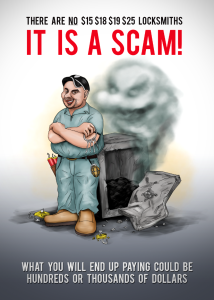 Unfortunately, many times, people fall for the scams of these criminals. Today, a very smart Calgary accountant did what we suggest everyone to do, think and refuse to pay. Mariya Savchyshyn owns a condo in Calgary and rents it out. She said her tenants asked her to replace their lock, and a Google search listed Locksmith Calgary at the top, so she called them without doing her searches to see that they are a scammer locksmith. Finding out if a locksmith company is a scam is quite easy, here are a few simple steps from Terry Whin-Yates to catch them. Do they provide unbelievably cheap pricing? 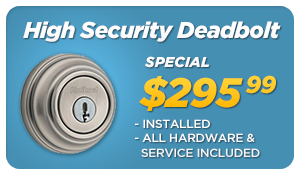 The $29, $19, $39 dollar locksmith ads are a scam. Do they operate under different business names? Scammer locksmiths often run under different business names to shield their identity. Is their Google Maps location legitimate? Many locksmith scammers have their Google Maps locations out of gas stations, Starbucks locations, restaurants, or even a middle of a forest (we’ve seen it all). Pull up their location on Google street view and see where their address is, if it’s another business, it’s a fake. If it’s a house, it’s a scam. 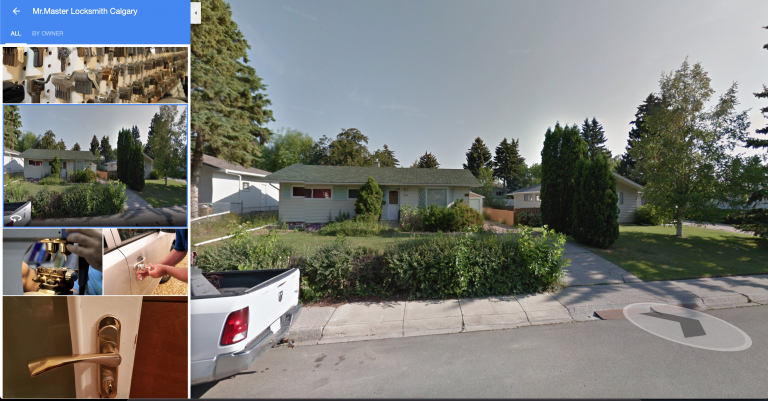 For example, the Locksmith Calgary scammer presents their address as 724 80 Ave SW, Calgary AB. This is a fake location. Are they licensed? In British Columbia for example, you can check if a locksmith company is licensed or not by inputting their security license number into the following page – Security Licence Status Verification. Check their phone number! Copy their phone number into Google, does it appear in locations like Toronto and other provinces or states where the locksmith shouldn’t be? It’s a fake. Ask for the name of the business owner and a link to his or her biography, if the company is hesitant to provide the information of the owner of the company, stay away. Ask for ID and documentation. Do not let them start work without the company showing their security license, drivers license, insurance, and city business license. If they say “I don’t have it” or “I can send it to you later” or if it looks fake, refuse them doing the work, refuse to pay and send them away. If the locksmith gets aggressive or pushy with their tactics or if at any time you feel uneasy or uncomfortable, dial 911 immediately. Do they have a reputation? If you can’t find anything about them online such as a social media following or a clean track record, do not let them work on your property as they are most likely a locksmith scammer. 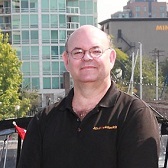 Reputable locksmiths and locksmith business owners like Terry Whin-Yates, the owner of Mr. Locksmith and Mr. ProLock have a clean track record. Do they show up in an unmarked vehicle, or does their vehicle simply say “locksmith service” ? 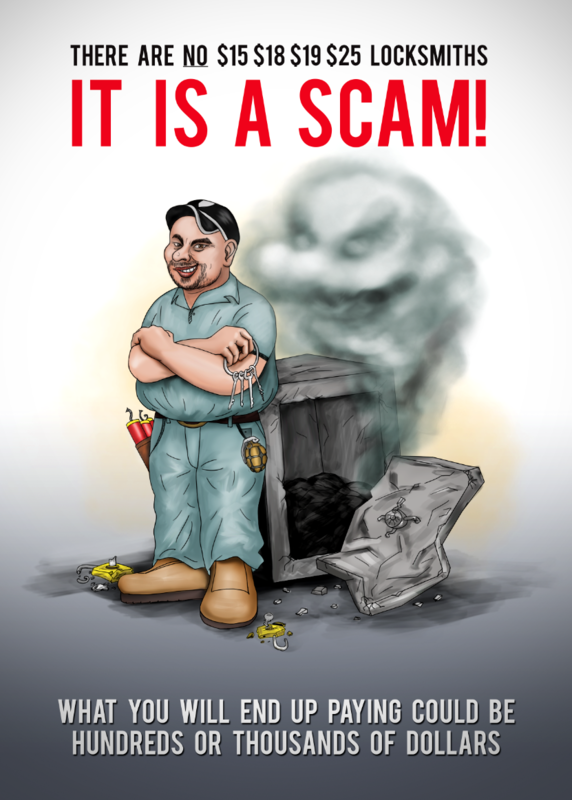 They are most likely a scam, do not allow them entry or to do any work on your property. Do they refuse to provide an invoice on the spot? Are there inflated or hidden charges? Refuse to pay and if they get aggressive, dial 911. Do they have a GST number on the invoice? Check if it’s legitimate here. 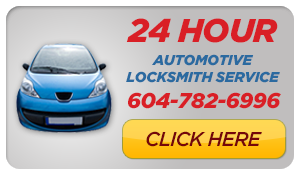 Do they list their locksmiths on their website like on a team page with their name and pictures like we do with locksmith Vancouver? If not, you have to wonder why and what they’re hiding. There are many more warning signs to catch a scammer locksmith. Just use your head and if you can’t determine if they’re fake or not, don’t use them! One big warning sign which Mariya Savchyshyn should have caught onto was the fact that the scammer locksmith, Locksmith Calgary used the tenant’s phone to phone her. Why wouldn’t they use their own cell number? Because these scammer locksmith’s do not want repeat customers. 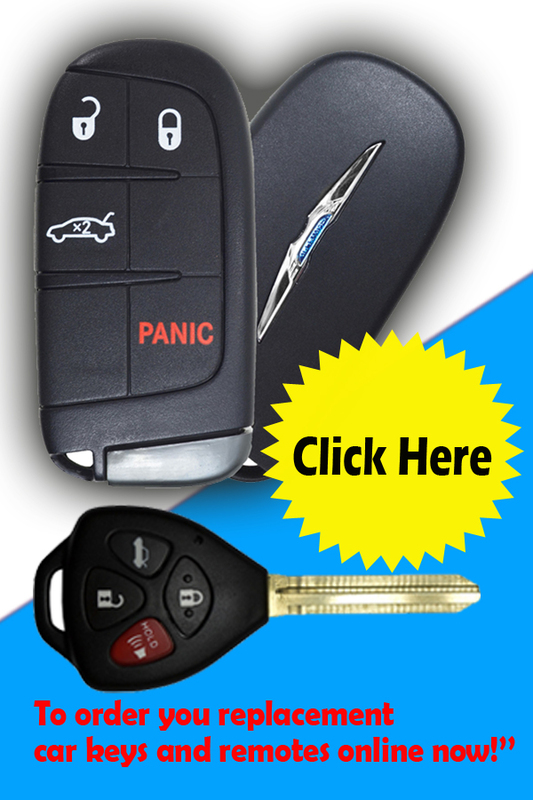 Scammer locksmiths such as locksmith Calgary operate on a one-hit basis. They scam you, and then they request an extreme amount of money and force you to pay. Because of the bad experience they provide, they don’t expect you to call back which is why they provide an illegitimate invoice with a fraudulent tax ID, a fake address and at often times as well, a fake phone number. Thankfully, when the scammer locksmith called Mariya Savchyshyn to say that he’s done, she caught on. Locksmith Calgary refused to provide an itemized invoice for the inflated invoice which was triple the cost, $773.85 as per CBC. “And I’m like, that’s weird, because usually the customer has to receive an invoice, look at it and then pay, right?” said Savchyshyn. When Savchyshyn refused to pay without knowing exactly what she was paying for — she says the company threatened to send the bill to a collection agency. Terry Whin-Yates states that threats are common with scammer locksmiths. We’ve heard from people that the scammer locksmiths have gotten violent with violent threats, verbal threats, death threats and unfortunately much more. “I just want to warn people because someone … might be scared because that company is scaring people by saying they’ll send them to collections,” she said. A scammer locksmith will have a hard time sending you to a legitimate collections agency. Collection agencies are not stupid, they will ask for supporting documentation which the scammer locksmiths will not have. Do not be fooled by the collection agency trick. If they do send you to collections, you can fight it by signing up to a low-cost service called LegalShield. This should be an immediate red flag. No legitimate company issues an invoice after payment. We, for example always issue an itemized invoice before the customer pays, because that’s the correct way of doing business. If a customer has a question, we’re always there to answer that question. It is ok to ask the locksmith who their credit card processor is for collecting payments. Credit card processors are the companies that collect your payment on behalf of the merchant and then provide the merchant with the funds. Names of some credit card processors are: Moneris, Square, Payfirma, Helcim, Stripe. If the locksmith doesn’t know or refuses to answer the question, refuse to pay. If they demand cash, refuse to pay. Scammer Locksmiths: There are no $15-$25 Locksmiths, it is a Scam. Shouldn’t a company know their invoices? This is a trick that scammer locksmiths like locksmith Calgary do. When approached by authorities or by a large media outlet like CBC Calgary, they start acting stupid. Mariya Savchyshyn should still dispute the charges with her credit card company and get the full sum back. We’ve baited the scammer locksmiths before with the help of the media. Check out Terry Whin-Yates collaboration with CTV News with our undercover investigation on locksmith scammers. “That’s an easy lock,” McLaughlin said. “No, it’s not easy. Five pins, medium security,” he explains. The locksmith showed McLaughlin his security license, which showed he’s a locksmith under supervision and then he called his boss. “Why are you charging so much?” McLaughlin asked into the phone. “It’s none of your business,” said the boss. Here’s the thing about scammer locksmiths. They utilize a central call centre for lead generation services. When you call a scammer locksmith like locksmith Calgary, you’re not dealing with the actual locksmith that’s coming out to service your lock. These scammers pay these call centres around 20% for the lead and taking the call. While the people in the call centre may seem nice, don’t be fooled, they’re not the ones coming out to work on your lock.